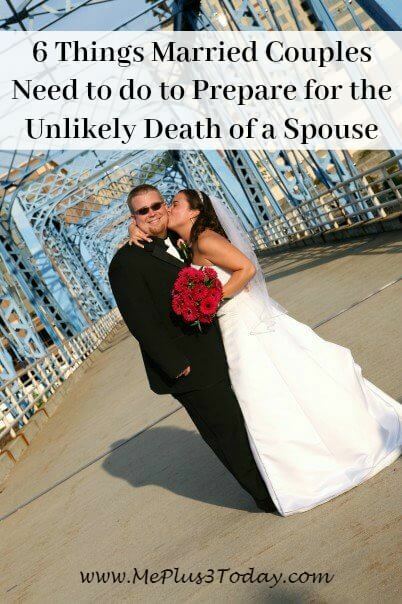 For your convenience, this post to help married couples prepare for death of spouse may contain affiliate links. I don’t think there is anybody that enjoys talking about the possibility of losing a loved one, especially their spouse. But unfortunately, death is something that will eventually happen to all of us. And what if it happens much, MUCH sooner than you had ever thought possible? Are you prepared? 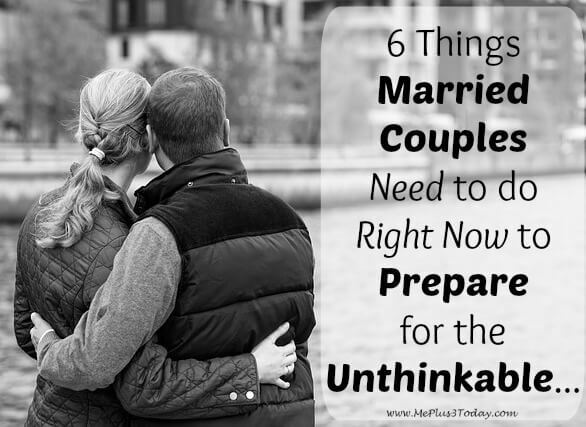 Based on my experience, I think there are 6 things that married couples NEED to do RIGHT NOW to prepare for the unlikely death of a spouse. I know, it is very strange for me to say that anybody needs to do something. I don’t typically like to tell people what to do. But when my husband, Chaz, unexpectedly died at the tender age of 30, I found these 6 things so incredibly important that they really do need to be done. As an additional disclaimer, this is NOT legal or professional advice. Everything I say is based on my own personal experience. OK, now on to the one of the most depressing topics ever. Chaz and I didn’t get life insurance until after we had kids. After this experience, I see how ignorant it was that we waited so long. Even if you don’t have kids, you really need to think about getting it. If you have a mortgage or any other outstanding debt in both names, ask yourself if you can afford it on only 1 income? Would you be able to afford a funeral? Would you want to take time off work to grieve? Depending on the answers to these questions, it’s probably important to get life insurance to be prepared for the worst. When you add in children, there are even more questions to ask! Would you be able to support their basic needs of food, clothing, and shelter? Would you want them to maintain their current lifestyle, whether that be involvement in extracurricular activities or private schooling? If they are very young, what about diapers, wipes, daycare, and/or formula? If you are looking to minimize premiums on life insurance, I’ve read that the higher earner in a family typically has a larger policy, so you could get a smaller policy for the spouse who earns less. Also, it is more affordable when you are young and healthy, so DO NOT WAIT. But of course, please do your research. Shop around. And consider getting professional advice if it gets to be too overwhelming. The next thing to do is set up a Will and Trust. Even if you don’t have any assets or children, it still sets up important aspects like Power of Attorney and who makes other important decisions if your spouse is unable to. It is especially important to set this up if you have children. If something happens to both of you, don’t you want your children to be in the absolute best care? Don’t let them get caught up in whatever legal stuff happens after you die. I think there are programs online that allow you to set these up on your own, but I highly suggest having a professional help you. That way, you can be sure that it is legal, there is proper back-up documentation, and they might be able to explain or ask questions about issues you never would have thought of. Make sure you and your spouse are aware of all accounts that are out there, whether they be investments, bank, student loans, or even utility bills. Searching for all of this information is just another thing you do not want to be doing when you are grieving. Also document all passwords and SECURITY QUESTIONS and keep them somewhere protected, like a fireproof and waterproof safe. And PLEASE make sure you update the document each time you change a password. Once you have life insurance and a living will and/or trust, keep those in a safe place too. Also have social security cards, birth certificates, and your marriage license in a secure location. While one of you may typically manage the finances, it is important that the other have at least a general understanding of what’s going on. It can be overwhelming to get all this together right now, but trust me when I say, it’s even worse if you have to do it after the fact. OK, this one might not seem as important as the first three. And that’s because it’s not. But I still felt it necessary to include it on this list. Because think about it, if your spouse passes away unexpectedly, do you really want to be running around, figuring out which cemetery to lay them to rest in? It is actually a really important decision that can’t be undone. So if after the fact, you are unhappy with it for some reason, there really isn’t much you can do. Do you want it to be near where you currently live? Or in your hometown? Is there a family plot somewhere that you’d like to be? If you want cremation and your ashes spread somewhere, in an urn, or in a cemetery? How much do certain cemeteries cost and what other fees are associated with burial? Also discuss if you have any preferences regarding headstones, caskets, and other specific details or requests relating to memorial services. Yes, it is depressing. But it is so important to decide on this now, so it’s one less thing to deal with when you are hurting the worst. Also, did you know that you might be able to prepay for specific items involved with the cemetery. It is something to consider so that there is one less expense to be dealt with during a time of debilitating grief. Check with whatever cemetery you decide on, and see what they can help you with. Believe it or not, Chaz had managed to get us a deal of “Buy 1, get 1 free” for our cemetery plots just a few years before he passed away! It’s a running joke in our family because he loved to get the absolute best deal on everything! Another topic that isn’t necessarily essential to discuss, but that will greatly ease a burden if something unfortunate occurred. Discuss whether you want to be an organ donor. There are many other topics along this same line that are important for married couples to have and are typically included in your Living Will and Trust (see #2). So hopefully this is something you may have already gone over. I just wanted to include this so it gets some discussion going about the unlikely death of you or your spouse. You might “think” you know what they want, but don’t you want to be absolutely sure? It’s just another one of those decisions you don’t want to be left with at the last minute. I suggest writing these decisions down and keeping them somewhere safe, just in case you forget when you are under incredible stress. Or if you have decided on organ donation, then simply sign up right now so the question doesn’t even need to be asked if something unfortunate happens. This is more important than anything on this list. Go find your spouse right now, give them a hug and kiss, and tell them how much you love them. I hope I’m correct in assuming that this needs no explanation as to why you NEED to do it RIGHT NOW. Well, thank you for baring with me through this horribly depressing topic. But I hope you come away a little more knowledgeable on what NEEDS to be done to prepare you for the unlikely death of your spouse. I can honestly and truly say that I hope you NEVER need to use this. But I do hope you will be prepared, just in case. 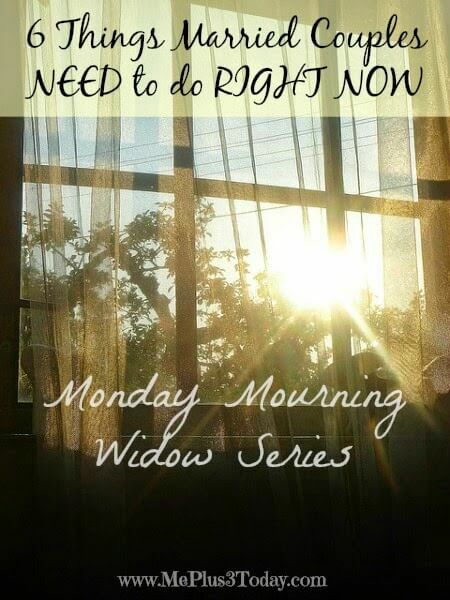 Click here to read all the posts in the Monday Mourning Widow Series. Visit Me Plus 3 TODAY’s profile on Pinterest. 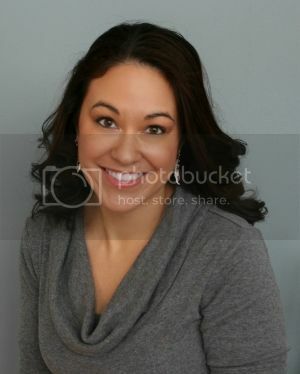 Tagged estate planning, Motherhood, Tips & Tricks, Widowhood. Bookmark the permalink. 5 Comments on "6 Things Married Couples Need to do to Prepare for Unlikely Death of a Spouse"
Oh man, good stuff. I have two aunts who were widowed early, I need to get on this! Great info. After three deaths in the family within a year and having to deal with some of these issues, it's important that people plan for this. Thank you Sarah! Brad and I have got this list down! You know it's especially important with children 🙁 Even if we don't want to think about it! Thanks for sharing. You are featured on tomorrow's IBA Weekly Roundup! It is genuinely good for the readers to go through something which is appealing and the instincts in mind get a boost. Hopefully, we will get to read more of this through similar posts. I express my thanks and gratitude to the writer and the website for uncovering vital information.